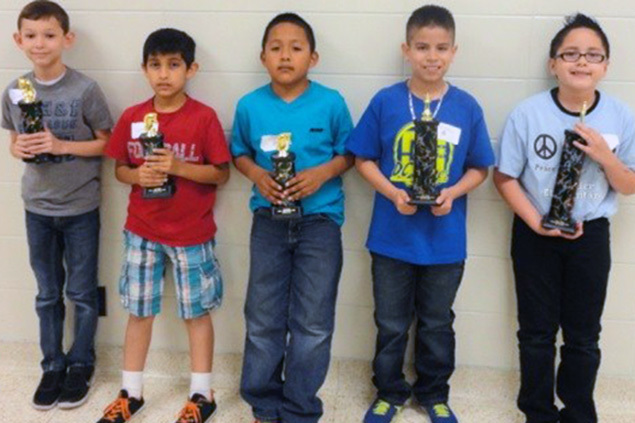 Pasadena ISD students participated in a quiet battle of the minds during the district's Fourth Annual Chess Championship at Beverly Hills Intermediate Thursday, May 1. The event attracted an-all time high of about 150 students from 20 campuses throughout the district and one school from Deer Park ISD. The championship was divided into four separate divisions including elementary (grades 3 and 4), middle (grades 5 and 6), intermediate (grades 7 and 8) and high school (grades 9-12). Students in grades three through eight played six games per round and received one point for each win and a half-point for a draw. High school students played a total of three rounds. The following students won first place in the corresponding divisions: Frazier Elementary third grader Dylan Campos, Bobby Shaw sixth grader Victor Vargas, Beverly Hills eighth grader Chandler Bui and Dobie ninth grader John Cruz. The goal of the chess program is to encourage students to think critically and use good judgment. Studies show that students who play chess make higher scores on standardized tests than those who do not. Here is a complete list of this year’s winners. Photos of the winners are featured below.